Having been established in the city of Wolverhampton for over 30 years we have experience in all types of ladies and gents hairdressing. 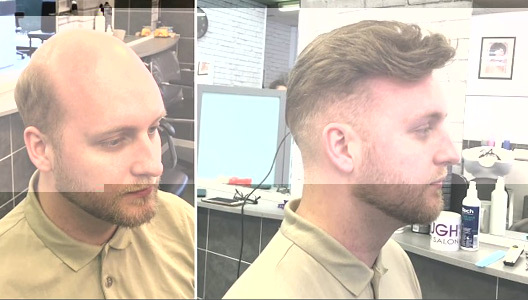 We also specialise in non surgical hair replacement and wigs, providing the answer to male and female hair loss. David. J. Hough himself is a British National and European hairstyling championships judge, and has travelled the globe judging several championships, most recently returning from Frankfurt, Germany – view newspaper and press articles here. We offer fantastic value for money with the highest quality of hairdressing – 5 members of our staff have been with us for over 20 years each and our reputation is built on the experience we have. Hair loss, thining hair or pattern baldness? 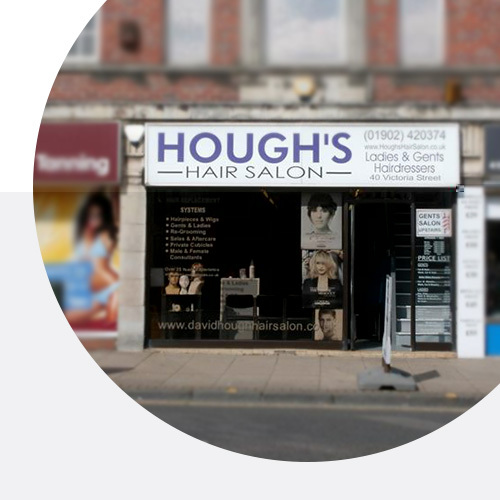 Hough’s Hair Salon Wolverhampton – We not only provide an excellent service in ladies and gents hairdressing but we also have many years experience in hair replacement systems, hairpieces and wigs for male and female hair loss. The salon itself consists of two floors with seperate departments for ladies and gents. Our reputation is built on the history of the hair salon wolverhampton and 5 of our employees have been with us for over 20 years. Offering value for money through the quality of our hairdressing and discounts for senior citizens is what we are known for and we pride ourselves on ensuring all our customers are looked after and receive the best quality service possible. You do not need to book an appointment but to ensure we can have stylists available you can call us and book on 01902 420374 – we are in the city cente at 40, Victoria Street, Wolverhampton, WV1 3PJ. Hair loss, thinning hair or baldness? "I was concerned about loosing my hair but David and the team made me feel at ease -the results are superb - Thanks"
"I have been having my hair cut at Hough's for over 15 years and would like to say how friendly the staff always are"
Over the years we have featured in local newspapers for the hair salon in general and also for David Hough’s role a British Champsionship Judge.